Saturday was Sweetest Day. If you’re not familiar with the holiday, know that you’re not alone. It’s not a very widely publicized holiday, and you won’t find many greeting cards for Sweetest Day. 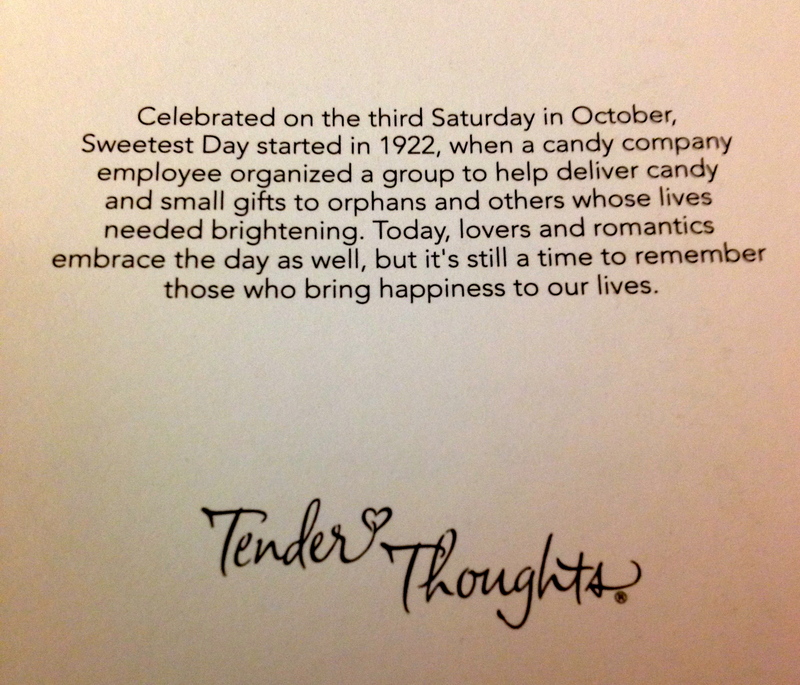 (The history of Sweetest Day goes back almost 100 years). In our family, Sweetest Day meant I gave my guys (my husband and son) a card and a small surprise. But then it was off to regular Saturday chores, like doing laundry and going grocery shopping. But this Saturday was a little different. I had an MRI scheduled Saturday afternoon. The last time I had an MRI was two years ago so the doctors wanted some current images to see what was happening with my left leg. This MRI (probably the worst one I’ve ever experienced, but that’s another blog post) really demonstrated how our family does Sweetest Day. While my husband and I were at Cedars Sinai for more than two-and-a-half hours, our son was having a great time hanging out with Grandma and Grandpa (my parents). My husband had taken the day off work to be with me. Well-meaning friends wrote me emails and texts wishing me luck and sending me love and “thinking of you” messages. When Ryan saw me after the MRI, he was concerned. I had an identification bracelet around my wrist and a bandage around my arm (a “contrast” had been injected into my arm). Ryan looked at me, gave me a kiss, and said we needed a big, big hug. He was right. I did. My Sweetest Day may not have been filled with chocolate flavored sweets, but it was still sweet in its own way. It made me see how many people I have to count on during these not-so-sweet moments. Saturday night, 5:55 pm. I was in the kitchen, finishing up dinner preparations. My husband, Paul, was still at work. My son, Ryan, was busy in the living room, working on a sketch. And then … a shooting pain in my left hip, down my thigh, and stopping at my knee. Pain that left me hunched over. Pain that forced me to lean on the furniture as I tried to carry Ryan’s glass of milk to the dining table. I didn’t want Ryan to see me like this … crying, incapable of standing without leaning on something, feeling as if I was going to crumble down to the floor and be unable to get up. Because I’m always trying to keep things going, to maintain as regular a routine as possible, I did the only thing I knew to do — I carried on with dinner. There really wasn’t anything we could do. If I needed help, my parents were just a phone call away. And Paul would be home from work in about thirty minutes. So Ryan and I carried on and began dinner. But then, he surprised me. Ryan got up from the table and got the iPhone. He did some swiping and tapping until music began to play. (We often have music playing during dinner). “This will help you feel better,” he said as Sade began to sing. The music didn’t make the pain go away, but Ryan’s sweet gesture did make my heart feel good. Because when I’m in pain like that, there’s usually no rhyme or reason to it. I don’t always know when it will strike or how long it will last. (Saturday night it lasted a few hours). And there’s really no way to make it better. So Ryan did what he could. He acknowledged my pain, my discomfort. And he did something that he knew would make us both smile. 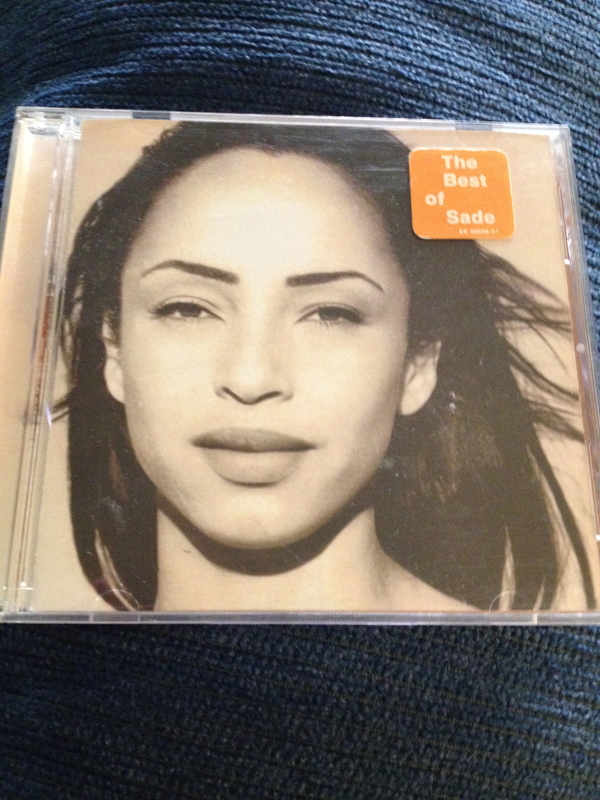 The mood was lifted, and It wasn’t just the power of music or Sade’s smooth sound. It was the power of our family’s love. I’m also proud to share some publication news with you! Two of my personal essays have recently been published on The Mighty. 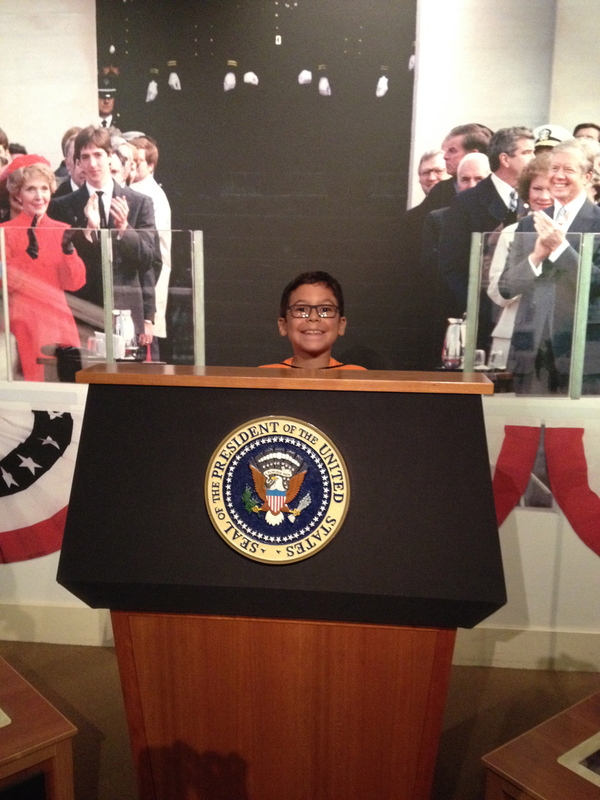 Last summer, Ryan and I visited the Ronald Reagan Presidential Library and Museum for the first time. Ryan was completely engrossed in the exhibits, the Oval Office Replica, the section of the Berlin Wall, the jelly bean portrait of Mr. Reagan, and of course, the opportunity to walk aboard Air Force One. This summer we visited again (but this time brought my husband along). And Ryan was just as interested, just as curious, just as engaged. When we got home, I couldn’t stop thinking about some of what we had seen. I couldn’t stop thinking about the secret service agents — these often behind-the-scenes men and women who do so much for our country. And from that, I was inspired to write a personal essay — “Moms As Secret Service Agents.” You can click here to read it on MomsLA.com. I’m currently reading three books. 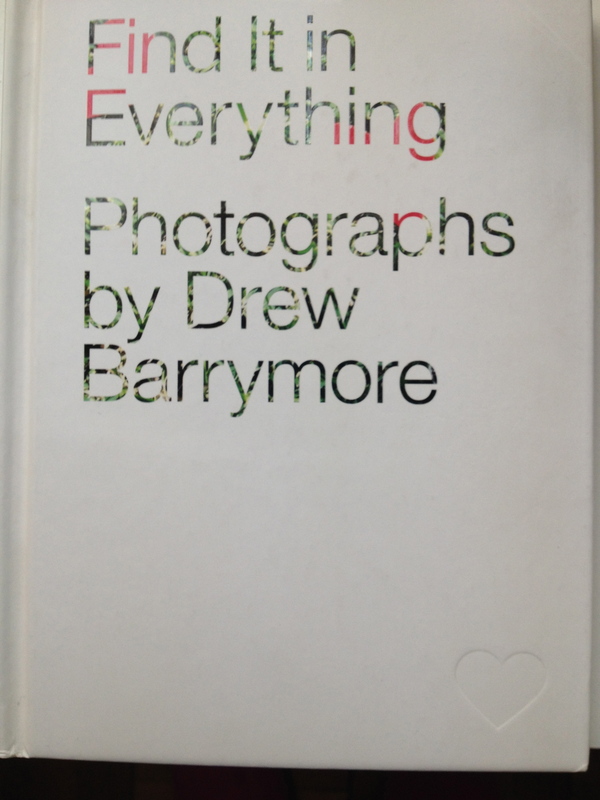 One of them, Drew Barrymore’s Find It in Everything, isn’t really a book you read as much as it is a book you look at. Ms. Barrymore is a fan of hearts, and the book is a collection of random heart-shapes she’s found, sometimes where you’d least expect it, like on a leaf or some tuna steaks. Sunday was a not good day for me health-wise. I wasn’t feeling well at all, though I tried my best to not have it interfere with our family’s one day off together. We didn’t visit a museum like we had planned, but we still had a fun day at home — putting up our Halloween decorations, baking cookies, reading together. We went outside on Sunday afternoon for some play-time (though I was “benched” for this session), and as we walked over to the area where we play handball, I looked down and spotted a heart on the sidewalk. I did a double-take, because I couldn’t believe this heart was there, just waiting for me to discover it. 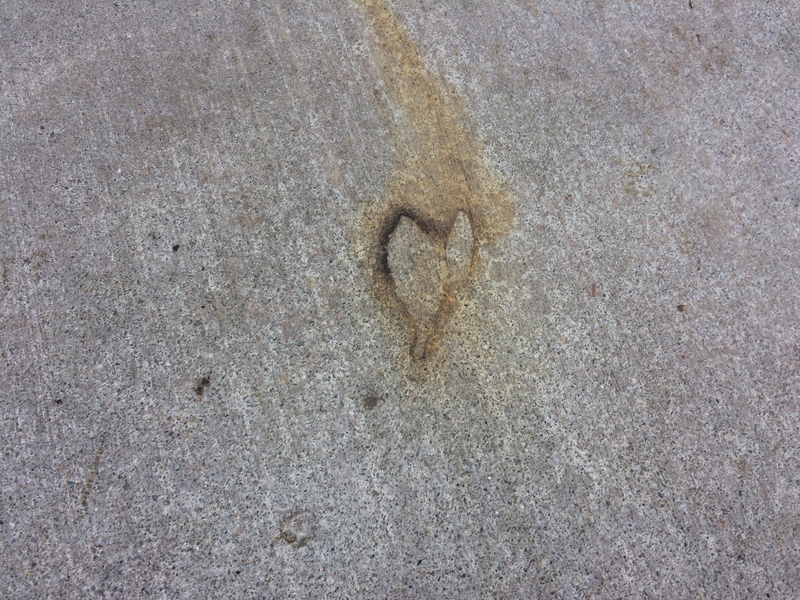 I walk this sidewalk every day, and never before have I seen this heart. I took it as a beautiful reminder that things will get better, and though I was having a bad pain and health day, it was a good family day. I had lots of reasons to smile and lots of love in our family. Speaking of love, the Los Angeles Sparks are playing their final game of the season tonight in Minnesota. The Sparks and the Minnesota Lynx have each been putting up a fight during this Finals series. The score is tied 2-2 which means the winner of tonight’s game is the winner of the WNBA Championship. Our Sparks won last year, and they’re looking to make it a back-to-back victory. But it seems like the Los Angeles Sparks don’t get a lot of the love and respect they deserve. So to show them we’re thinking of them, I ask you to please click here to read my post “6 Reasons Why Families Should Attend L.A. Sparks Games” published at MomsLA.com, and then if you’re on social media, please share the post. Get the word out. Let’s share the love and root for these talented athletes!